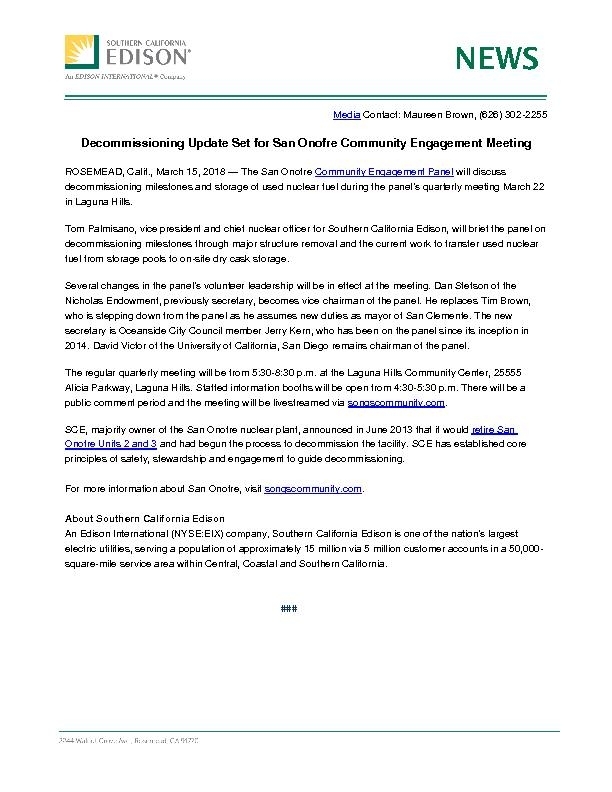 ROSEMEAD, Calif., March 15, 2018 — The San Onofre Community Engagement Panel will discuss decommissioning milestones and storage of used nuclear fuel during the panel’s quarterly meeting March 22 in Laguna Hills. Tom Palmisano, vice president and chief nuclear officer for Southern California Edison, will brief the panel on decommissioning milestones through major structure removal and the current work to transfer used nuclear fuel from storage pools to on-site dry cask storage. Several changes in the panel’s volunteer leadership will be in effect at the meeting. Dan Stetson of the Nicholas Endowment, previously secretary, becomes vice chairman of the panel. He replaces Tim Brown, who is stepping down from the panel as he assumes new duties as mayor of San Clemente. The new secretary is Oceanside City Council member Jerry Kern, who has been on the panel since its inception in 2014. David Victor of the University of California, San Diego remains chairman of the panel. The regular quarterly meeting will be from 5:30-8:30 p.m. at the Laguna Hills Community Center, 25555 Alicia Parkway, Laguna Hills. Staffed information booths will be open from 4:30-5:30 p.m. There will be a public comment period and the meeting will be livestreamed via songscommunity.com. SCE, majority owner of the San Onofre nuclear plant, announced in June 2013 that it would retire San Onofre Units 2 and 3 and had begun the process to decommission the facility. SCE has established core principles of safety, stewardship and engagement to guide decommissioning. An Edison International (NYSE:EIX) company, Southern California Edison is one of the nation's largest electric utilities, serving a population of nearly 15 million via 5 million customer accounts in a 50,000-square-mile service area within Central, Coastal and Southern California.